✅ SUPRISE YOUR BEST FRIENDS OR LOVED ONES WITH THIS ALL IN ONE PARTY KIT: Each premium baby shower package includes. 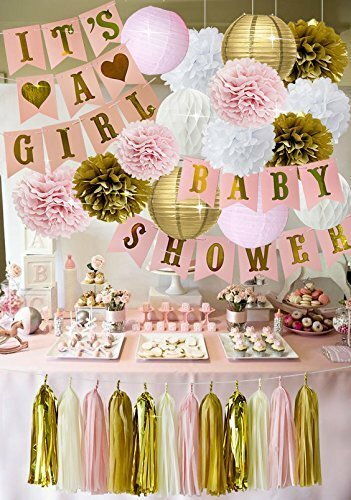 1 Pink and Gold baby shower banner, 1 Pink and Gold It's A Girl banner, 10 balloons (pink), 9 colorful pompoms (pink, gold and white), 4 paper lanterns (pink and gold) and 2 large honeycomb balls in white. 1 tablecloth (54in x 72in white). Each pack is carefully wrapped and packeged for consistency and quality. ✅ COMPLEMENT YOUR PARTY DÉCOR: With each letter measuring 8 inches our Baby Shower and It's A Girl Banners are the perfect size to complement your party décor. Hang from your walls, doors or patio outside.These decorations are the most aesthetically pleasing and will compliment any area around without the hassle & long hours of driving to crowded and overpriced shopping malls. ✅ FOR BABY SHOWERS & OTHER CELEBRATIONS: It's a perfect idea not only for your baby shower, but for a wedding, birthday party, bridal shower, graduation party or nursery room décor. These gorgeous pink-style decorations will add elegance & charm to any occasion. Set your party apart from all the others! ✅ GET THESE PARTY DECORATIONS RISK FREE: Your satisfaction guaranteed. That is why these baby shower it's a girl party supplies are backed by our 30 day money back guarantee policy!